I was pleased to get it, especially because the spider wasn’t thrilled with having its portrait made. I’m inclined. Quite a surprise to see this in my Reader! A good inclination to have: it let you face up to this image and read a lot into it. It’s pretty common to find spiders on flowers but this one was particularly striking. You didn’t catch him napping~ he’s all ready to “face” the day. Unfortunately I had to face the fact that the spider quickly hid inside the sepals. I ended up with exactly one picture, but one is all it takes. It is if it is a good one, as this is. I was satisfied. My routine is to take several pictures of a thing because slight changes (the breeze, camera movement, subject movement, accuracy of focus, etc.) let me pick the image that’s the best, or occasionally enhance a picture by borrowing a better part from a similar frame in the sequence. That is called bracketing, isn’t it? Or does that only refer to changes in settings? I didn’t know you could borrow a part of a similar frame. In my experience people have used the term bracketing to mean taking several pictures of the same thing at different exposures. My camera has a setting that lets me take three pictures in quick succession automatically, with one at the exposure the camera meters as proper, and the other two an adjustable number of f/stops over and under the metered one. Borrowing part of a frame amounts to selecting the desired part (say one that’s focused correctly) and pasting it over the corresponding part in another frame (where that part wasn’t focused as well). That way you can optimize the image as a whole. That’s really cool. I don’t think I have the software to do that. It would come in very handy with some of my paintings I think. I use Photoshop but I suspect there are free programs out there that let you do many of the same things. You could do a search for “free software editing program” and see what turns up. Thanks~ I would not have thought of that. Thanks. I’ll have a couple of avian ones in two days. I not only see the face, I’m amused by its expression of astonishment. Perhaps it didn’t expect to be entertaining a visitor with a camera. The anemones weren’t exactly thick in the hill country last weekend, but they were widespread, and a few already had shed their sepals. Despite the foggy and gloomy weather, spring’s clearly here. I also read astonishment into the face, especially with the spider’s two rear legs acting as upraised arms around the pareidolic head. I’m glad you got to observe some anemones, even if sparser than you’d have liked. Spring’s here, sort of. We got up to 77° yesterday but the temperature dropped 30° today and overcast and drizzle returned. The current forecast for lows on Monday and Tuesday says 32° and 33°. I hope the weather gods won’t make me do frostweed ice pictures again. Oh, I know what you mean about inscriptions in old books. I’ve always wondered who the people were and what became of them. Once, maybe a decade ago and thanks to the Internet, I managed to find out some things about the writer of one inscription. 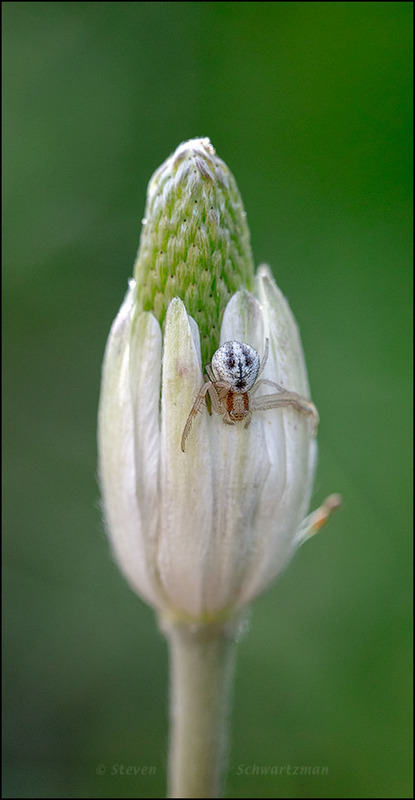 I love the crab spiders, but only have one really good set of pictures. The rest of the time, they moved too fast and I couldn’t whip out the camera fast enough. I’ve had generally good luck photographing crab spiders. Usually I’ve already had the camera with macro lens out to photograph a flower, as was true in this case, and then noticed the spider. Good luck adding to your one good set of pictures. I see the face – I believe he also has a mustache!! Cute little bonus that crab is. As mentioned earlier, a mustachioed face. Needless to say, not only do we have no flowers yet but a dearth of spiders as well. Just a few in the corners of the bathroom. I’m concerned about our wildflowers now because the latest weather forecast predicts even lower lows than the forecast a couple of days ago: 29° in the overnight from Sunday to Monday and again from Monday to Tuesday. That’s not cold enough for ice, so we get no benefit there, but it could do in the flowers. Maybe you could photograph some of those spiders in your bathroom. We have that happen here fairly often, but here is very different from there. We almost had Wisteria flowers last year until a frost did them in. Most plants fare alright, but flowering shrubs and trees take a solid hit from the cold. I’ve also noticed how flowering trees take a hit from a late freeze. Hey Steve what a fantastic shot! Thanks. I couldn’t have done it without my macro lens.